A screening of a film which was made during the Priory Park 100 celebrations was shown on Saturday morning. 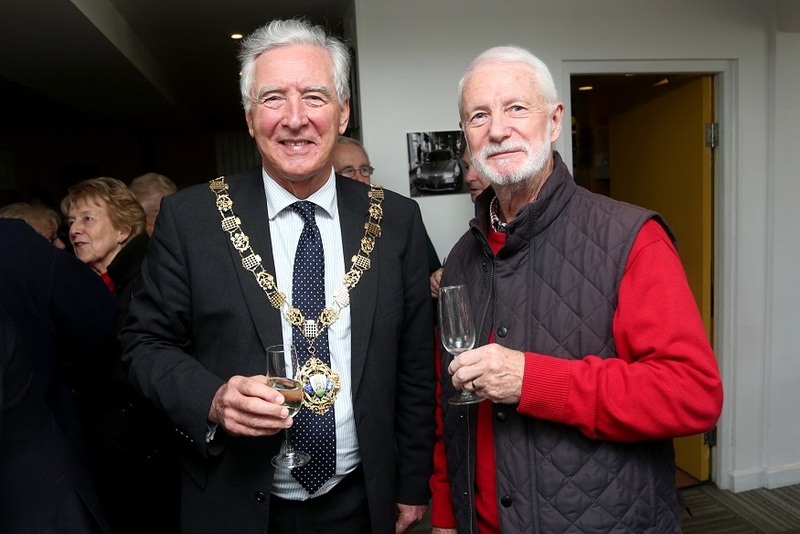 Special guests, including those who took part in the celebrations, residents, the Mayor of Chichester, Cllr Martyn Bell, pictured below with resident Tom Lecompte, and Friends of Priory Park, were invited to the showing at New Park Cinema. Highlights of the events included the cutting of the cake to start of the celebrations, a cricket match, the teddy bears picnic, stargazing with the South Downs Planetarium, the ‘special hands around the park’, an Art in Action display in the Guildhall, the play, The Hawkhurst Gang, the unveiling of the fully restored plaque at the gates of Priory Park and, of course, the drumhead service. Friends of Priory Park chairman Philip Robinson said: “Priory Park 100, Clive Hand’s film, was a perfectly crafted evocation of the park, Chichester’s ‘village green’. “It illustrated how the community came together in memory of the sacrifice of so many 100 years ago. It also celebrated the diversity of activities the park has accommodated over time, each respectful of its heritage. A hundred years ago in September last year, Priory Park was given by the 7th Duke of Richmond and Gordon to the people of the city, for their leisure and as a perpetual memorial to the fallen in the First World War. To celebrate Priory Park’s centenary birthday on September 30, The Friends of Priory Park and Priory Park Festival are combining for ten days of celebrations starting this afternoon. Priory Park 100 organiser Richard Plowman said: “Clive Hand’s film documentary captured perfectly what was one of the largest community celebrations in the past 50 years, the 17 events of the Priory Park centenary in 2018. “As one lady who I had never met put it: ‘I have lived in Chichester for 12 years and Priory Park 100 was the first time I felt part of the community’.